Houston star James Harden was crowned the National Basketball Association's Most Valuable Player for 2018 on Monday. 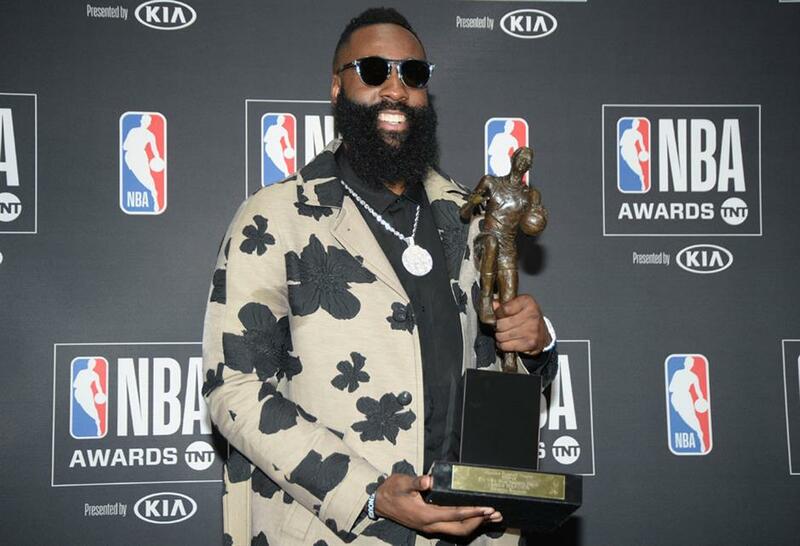 Houston Rockets guard James Harden poses with his MVP award during the NBA Award Show in Los Angeles on Monday. Houston star James Harden was crowned the National Basketball Association’s Most Valuable Player for 2018 on Monday, taking home the honor despite a disappointing end to the season which saw the Rockets ousted before the NBA Finals. The 28-year-old Rockets guard beat out competition from Cleveland Cavaliers icon LeBron James and the New Orleans Pelicans’ Anthony Davis. Harden’s award came after a season where he averaged more than 30 points per game, with 5.4 rebounds and 8.8 assists. Although Houston finished the regular season on top of the Western Conference, it was beaten 3-4 in the playoffs by the Golden State Warriors. The Warriors would go on to beat Cleveland 4-0 in the finals. Although the Warriors clinched their third title in four seasons this season, they were largely ignored in the main end-of-season awards categories at Monday’s ceremony in Los Angeles. Philadelphia 76ers star Ben Simmons was named Rookie of the Year ahead of Utah’s Donovan Mitchell and Boston’s Jayson Tatum. Rudy Gobert of the Utah Jazz won Defensive Player of the Year, edging out New Orleans’ Davis and the Sixers Joel Embiid. Meanwhile, Coach of the Year honors went to Dwane Casey, who was fired by the Toronto Raptors after they were swept by Cleveland in the second round of the playoffs. Casey’s honor came after a successful regular season which saw the Raptors finish with a franchise-record 59 wins. Widely admired across the league, Casey was snapped up by Detroit Pistons owner Tom Gores, roughly one month after being sacked by Toronto. “When you get fired, which I did recently, you always doubt yourself a little bit, you think ‘Okay, can I do this? Do I want to do this again?’” Casey said.